Janet Eoff Berend’s debut novel, Vertical, is a fast paced story that offers an inside view of the teenage skateboarding world. Knowing very little about the specifics of skateboarding, I appreciated the easy-to-use glossary of the terms, which helped me to better visualize some of the skate scenes. 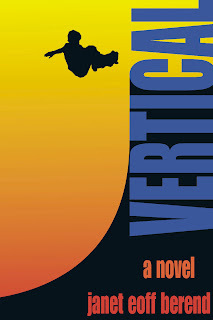 I think Vertical would be an excellent addition to classroom libraries because it will reach readers, reluctant or otherwise, who have an interest in skateboarding. From the backcover: Skateboarder Josh Lowman witnesses one of the best skateboarders in town (the local bully) commit a crime. For days he agonizes over whether to tell anyone. Meanwhile, his friendships with a fellow skater, a girl in his English class, and a cool math tutor (a college student who skates) slowly steer him toward a new kind of courage. One of the strengths of Vertical was the ongoing metaphor of skating compared to life in general. Another strength was the authenticity of the voice. And, without any spoilers, the climax of the story was surprising and intense. A little bit about the Publisher: BreakawayBooks: (from their website) Breakaway Books publishes literary and thoughtful writing on sports — fiction, poetry, and essays on the athletic experience. We are interested in the emotional and metaphysical side of sports, the inner life of the athlete. We also celebrate the many ways sport can serve as muse for excellent writing — both serious and playful. The Book Trailer below does an excellent job of capturing the spirit of the book. Thanks for adding to the mayhem! Like us because we're needy! The authors of Project Mayhem do their best to provide accurate, witty, and sometimes manic information pertaining to all things middle grade. Any resemblance to anybody else's manic, witty, and accurate information is purely serendipitous. However, the views and opinions expressed herein are solely those of the individual authors, and do not necessarily reflect those of the other writers on this blog. Except, we all agree that reading Project Mayhem will brighten your day. Drop by mic. AN UNUSUAL PATH TO SUCCESS!